This is a result to be proud of, with an impressive 82% prize percentage in the province and 56% at national level. The first 3 pigeons that won a 1st, 5th and 12th respectively, will be discussed in closer detail below. 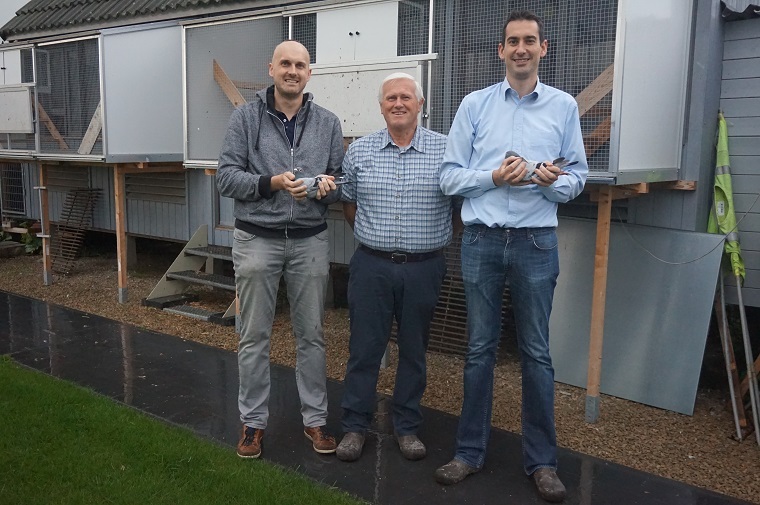 The pigeons were released in Valence on 9th of June at 6:30am, and racing hen Chanti was the first to arrive home in Wijgmaal at 15:54, covering 667km with a velocity of 1181 m/min. 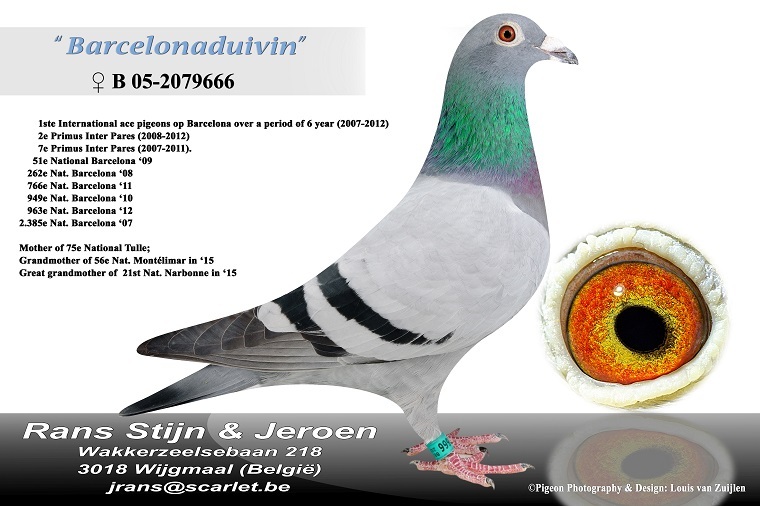 She claimed a 1st Provincial Zone B2 (2,408 p.) and a 1st Provincial Flemish Brabant (589 p.), as well as a 2nd National of 7,682 pigeons. stijn and Jeroen gave her the name Chanti, after their mother Chantal. And it was in fact their mother who saw the pigeon arrive home. The two brothers were working on Saturday, so their father was left on his own. Due to some issues with the KBDB's registration form, Rudi was in the loft trying to clock the pigeons from Chateauroux when Chanti arrived. Chanti had been basketed after 14 days of brooding. However, three days prior to basketing she and her male partner had been chased out of their box by a loft mate. They tried to have her breed on the floor but that dit not work out. They were then locked inside their box, after which they were able to continue brooding. Chanti is a sister of Jacques (33rd Nat. Narbonne) and a half sister of Jacqueline (87th Nat. Narbonne). Chanti comes from a first generation of youngsters that were trained properly as youngsters. These youngsters did Bourges and Nevers in 2016. In 2017, the team tested a few yearlings, including Chanti, in the races from Agen and Narbonne. And Chanti did great in both races. The sire of Chanti is BE06-811, also the sire of a 21st Nat. Narbonne, an 87th Nat. Narbonne and a 150th Nat. Tulle. The dam of Chanti (BE10-116) is a granddaughter of the two top breeders Montauban x Barcelona duivin, and she won a 75th Nat. Libourne herself as well. Click here for Chanti's full pedigree. She is now the dam of a 1st Nat. Perpignan. Click here for some results from her youngsters, grandchildren and great-grandchildren up until 2017. The sire of Georgette is Lucky Jef. He is a grandson of top breeder Lucky 848 (De Rauw-Sablon). The dam is Jose, and she is also the dam of a 28th Nat. Motelimar, a 75th Montelimar and a 52nd Nat. Jarnac. Click here for Georgette's pedigree. 90th Nat. Valence    7,682 p.
67th Interprov. Montelimar 1,605 p.
59th Nat. Narbonne   3,424 p.
Stijn and Jeroen had a great result in a rather difficult race from Valence, which shows that they are pretty much ready for the upcoming long distance races. They claimed their first provincial and zonal win of the season, and their prize percentages have given them great confidence. 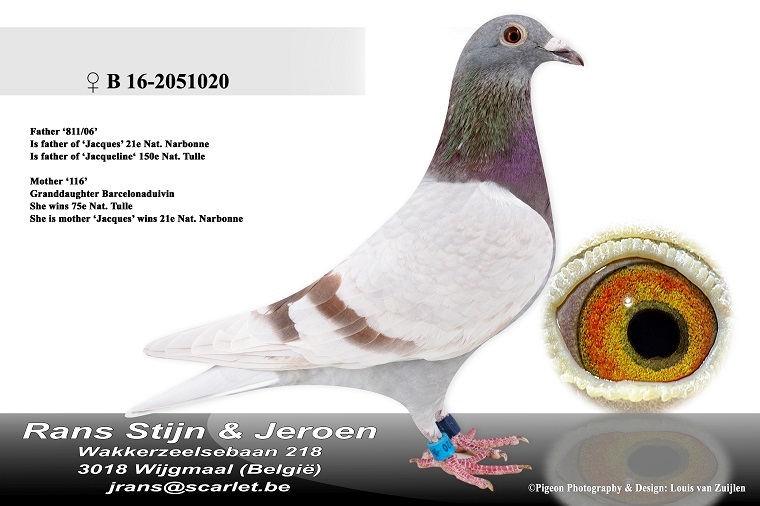 We reckon the pigeons of Jeroen & Stijn Rans will appear in the national results repeatedly in the coming few weeks.